Video and link to interactive timeline below. Just past midnight July 30, 1945, two torpedoes from a Japanese submarine struck the USS Indianapolis with almost 1,200 people aboard. The subsequent explosions obliterated the ship’s front end, and tons of water rushed in. Bulkheads crumpled under the force. The ship, tilting heavily on its right side, began to nosedive into the ocean. It took 12 minutes for the 14-year-old cruiser to sink. Moments before the Indy’s tail end plunged into the water, Marine Cpl. Edgar Harrell hung onto the ship’s left-side railing. Terrified, he realized he might not survive. As a sense of “utter helplessness” came upon him, Harrell said he cried out to God for help. Nearly 300 of the Indy’s crew went down with the ship. Of the 900 who abandoned ship, only 317 would survive. Harrell would have to remind himself over the next four days not to lose hope but to cling to the conviction that God would see him through. Harrell, one of 36 survivors still living today, said he expects to see 15 or 16 of his former shipmates at a reunion July 24-26 in Indianapolis commemorating the 69th anniversary of the sinking. Hundreds of second-, third- and fourth-generation family members of the crewmembers will also be there, sharing stories and catching up. A day doesn’t go by, Harrell said, that the memories of the sinking and days spent afloat in shark-infested waters don’t haunt him. For years, he was unable to fully talk about what happened without reliving the terror. But writing about the disaster has brought catharsis and given him a new purpose. Harrell said he’s amazed so few people know the story of the USS Indianapolis. The U.S. military had selected the Indy for a highly classified mission from California to the Pacific island of Tinian. Only after their rescue, and while convalescing at a military hospital in the Pacific, did the Indy survivors learn that the top-secret cargo they delivered contained nuclear material for the atomic bombs dropped on Hiroshima and Nagasaki, leading to Japan’s surrender. Invited to speak at colleges, high schools and grade schools, Harrell said he has found much ignorance among educators and students about how WWII ended and how the Indy played a vital part in that. But the lack of knowledge concerning the Indy’s sinking truly astounds Harrell. Baptized by a thick layer of oil and fuel as he entered feet first into the watery abyss, 20-year-old Harrell found himself with about 80 shipmates, many severely wounded. Their screams added to the dread on that first night. A third of Harrell’s group died before sunrise. The corpses became the constant companions of the living as they floated side by side. Praying for daylight to arrive, the shivering survivors would then find themselves begging for night to fall to protect them from the relentless heat, which would reach 110 degrees. With lips blistered and cracked from the sun, the survivors faced severe dehydration. Most had no food or water. The nightmare of that first day repeated itself as the survivors began to believe that no one was looking for them. Some took their lives. Others began drinking saltwater to quench their thirst, affecting body function and brain activity. With saltwater poisoning, some of the shipmates would become delirious, Harrell recalled. “And your buddy may become your enemy. … He may think that you’ve got a canteen of water hidden in your kapok lifejacket.” Sometimes a shipmate would unsheathe a knife and stab the person next to him, he said. By the third day, Harrell said his group of 80 had dwindled to 17. By the fourth day, he found himself half-delirious and alone with a Navy lieutenant, drifting on the swells. In his book, Harrell recounts missteps by Navy personnel who ignored distress signals sent from the Indy and who took no action when the cruiser failed to arrive at its destination. Had search and rescue operations been launched immediately, he believes, hundreds who died from shark attacks, dehydration or hypothermia might have been saved. Harrell calls it miraculous that any of the Indy’s crew made it out of the water alive. It was an act of “providence,” he said, that a Navy aviator, trying to stabilize an errant antenna on the rear of his aircraft, just happened to look down while flying over the area of the sinking. Seeing oil on the water and thinking it might have been from a Japanese sub, he flew lower, preparing to drop bombs. He quickly aborted that mission after spotting men in the water. 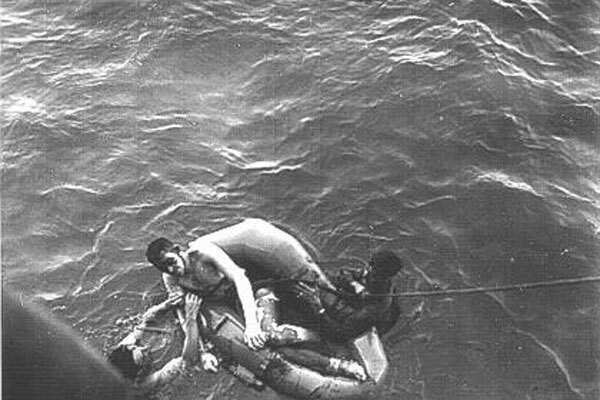 A call for help went out, and rescue operations began Aug. 2, 1945. 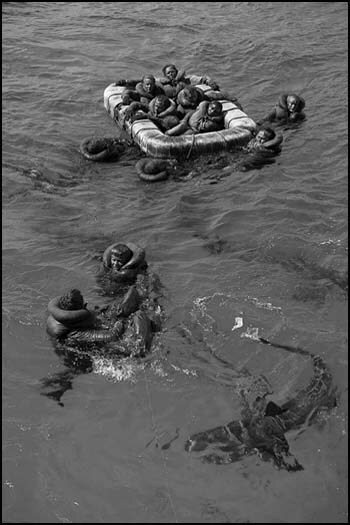 Seeing hordes of sharks attacking the survivors, a Navy aviator sent to the area to drop rafts and supplies disobeyed orders and landed his aircraft in the water. The rescue crew loaded as many survivors as they could and strapped more to the wings. They eventually picked up 56 grateful survivors, including Harrell, before nightfall. Ships arriving at the scene later that night and the next morning rounded up the rest of the survivors. In his book, Harrell recounts how the Navy made the Indy’s commanding officer, Capt. Charles McVay III, a scapegoat, while trying to cover up its own gross negligence. At a court-martial in December 1945, the Navy found McVay guilty of hazarding a ship by not taking evasive action. For years, he received hate mail from family members of those who died in the disaster. In 1968, he killed himself. For more than 50 years, the survivors fought the Navy to clear their captain’s “good name.” Then two unrelated events converged to shed a different light on the matter. In 1995, the Navy made its 1945 war documents public in the National Archives. About the same time, a sixth grader from Florida became interested in the USS Indianapolis after watching the movie “Jaws.” A research project would lead to a five-year lobbying effort to clear McVay of his court-martial conviction. President Bill Clinton signed a congressional resolution in October 2000 that exonerated McVay. The long crusade to clear McVay’s name consumed the survivors, who said the way the Navy dealt with their captain and the sinking set them adrift in a lonely sea of neglect a second time. A radio broadcast reporting the Indy’s demise and loss of life came only after President Harry Truman announced Japan’s surrender on Aug. 14, 1945, nearly two weeks after the Navy began rescuing its survivors. Harrell believes the Navy tried to keep the incident under wraps for as long as possible to underplay any possible charges of culpable negligence. News of Japan’s surrender and end of WWII would dwarf the news of the Indy’s sinking. via Nearly 70 years after USS Indianapolis tragedy, survivor tells his tale – U.S. – Stripes.